For the 1987 British film, see The Reluctant Dragon (1987 film). The Reluctant Dragon is a 1941 American film produced by Walt Disney, directed by Alfred Werker, and released by RKO Radio Pictures on June 20, 1941. Essentially a tour of the then-new Walt Disney Studios facility in Burbank, California, the film stars radio comedian Robert Benchley and many Disney staffers such as Ward Kimball, Fred Moore, Norman Ferguson, Clarence Nash, and Walt Disney, all as themselves. The first twenty minutes of the film are in black-and-white, and the remainder is in Technicolor. Most of the film is live-action, with four short animated segments inserted into the running time: a black-and-white segment featuring Casey Junior from Dumbo; and three Technicolor cartoons: Baby Weems, Goofy's How to Ride a Horse, and the extended-length short The Reluctant Dragon, based upon Kenneth Grahame's book of the same name. The total length of all animated parts is 40 minutes. The film starts at Robert Benchley's home as he plays in his swimming pool, shooting darts at toy ducks. It turns out that he is delaying in trying to sell the rights of The Reluctant Dragon to studio head Walt Disney. Benchley's wife finally convinces him to approach Disney so they drive to the Walt Disney Studios. There, she leaves him at the studio gate while she goes shopping. After his arrival, Benchley dodges an overly officious studio guide named Humphrey (played by Buddy Pepper). As he wanders around the studio, Benchley stumbles upon a number of the Disney operations and learns about the traditional animation process, some of the facets of which are explained by a staff employee named Doris (Frances Gifford). The life drawing classroom, where animators learn to caricature people and animals by observing the real thing. A film score and voice recording session featuring Clarence Nash, the voice of Donald Duck, and Florence Gill, the voice of Clara Cluck. A foley session for a cartoon featuring Casey Junior from Dumbo. Doris demonstrates the sonovox in this scene, which was used to create the train's voice. The camera room, featuring a demonstration of the multiplane camera. Upon Benchley's entering the camera room, the film turns from grayscale and black-and-white to Technicolor (a la The Wizard of Oz), prompting the droll Benchley to (breaking the fourth wall) examine his now red-and-blue tie and his yellow copy of the Reluctant Dragon storybook and comment, "Ahh...Technicolor!" When Doris arrives to show him around the camera room, she asks Benchley if he remembers her. His answer: "Yes, but you look so much different in Technicolor!" Donald Duck appears on the camera stand to help explain the mechanics of animation and animation photography. The ink-and-paint department, including a Technicolor-showcasing montage of the paint department. Doris presents a completed cel of the titular character from Bambi. The maquette-making department, which makes maquettes (small statues) to help the animators envision a character from all sides. Some of the maquettes on display included Aunt Sarah, Si, and Am from Lady and the Tramp and Captain Hook and Tinkerbell from Peter Pan; both films were in development at this time, but would be delayed by World War II and not completed until the 1950s. Also on display is a black centaurette from Fantasia, which Benchley admires. The employee on duty makes Benchley a maquette of himself, which many years later was purchased and owned by Warner Bros. director Chuck Jones. The storyboard department, where a group of storymen (one of whom is portrayed by Alan Ladd) test their idea for a new short on Benchley: Baby Weems. The story is shown to the audience in the form of an animatic, or a story reel, using limited animation. Loaned out by 20th Century Fox to direct this film, Alfred Werker later became the first outside film director to use the storyboard, which the Disney staff had developed from predecessive illustrated scripts during the early-1930s. The room of animators Ward Kimball, Fred Moore, and Norm Ferguson. Benchley watches Kimball animating Goofy. He and the audience are also treated to a preview of a new Goofy cartoon, How to Ride a Horse, the first of the many how-to parodies in the Goofy series. (RKO would later reissue How to Ride a Horse as a stand-alone short on February 24, 1950.) After viewing the Goofy presentation, Benchley witnesses Ferguson animating Pluto. Humphrey, who has been one step behind Benchley the entire film, finally apprehends him and delivers him in person to Walt Disney, who is in the studio projection room about to screen a newly completed film. As Benchley sits, he hands Disney the animated cel, the maquette, and discovers the centaurette in a pocket. 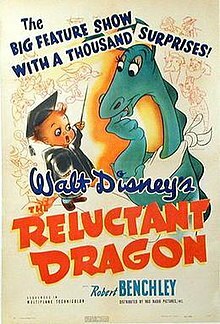 Disney invites Benchley to join them; to Benchley's slight embarrassment yet relief, the film they screen is a two-reel (twenty-minute) short based upon the very book Benchley wanted Walt to adapt, The Reluctant Dragon. The cartoon starts with an introduction by the narrator of the story. One of the main characters, The Boy, who is reading a book about knights and bloodthirsty dragons, is introduced. His father comes rushing by, claiming to have seen a monster. The Boy reassures his father that it was only a dragon, to which the father panics and runs to the village in fear. The Boy then goes to the Dragon's lair, where he is confronted not by a ferocious beast, but a shy, poetry spouting creature. Though surprised at seeing what a nice creature the Dragon is, the Boy befriends him. When he arrives back at the village, the Boy discovers that Sir Giles the Dragon slayer has arrived. He runs to tell the Dragon that he should fight him, only to be left disappointed when the Dragon announces that he never fights. The Boy visits Sir Giles (not St. George as in the original story), and it is revealed that Sir Giles is an old man. The Boy tells Sir Giles that the Dragon will never fight and they decide to visit him. Sir Giles and the Boy visit the Dragon while he is having a picnic. It turns out that Sir Giles also loves to make up poetry, so The Dragon and Sir Giles serenade each other. The Boy then asks if he could recite a poem of his own. From this, he uses his chance to get a word in edgewise to shout at them to arrange the fight. The Dragon leaves but is persuaded back out of his cave when he is flattered by Sir Giles. Sir Giles and the Dragon eventually decide to fight, but as Sir Giles and the Boy leave, the Dragon realizes in shock that he has accidentally agreed to a fight and tries to tell Sir Giles and the boy that he changed his mind, but they ignore him and the dragon mutters to himself why he cannot just keep his big mouth shut. The next day, the villagers gather to watch the fight. Sir Giles arrives waiting for the Dragon. "I promise not to rant or roar, and scourge the countryside anymore!" Sir Giles is drawn by the animators to somewhat resemble Don Quixote. The film closes on Benchley and his wife driving home; she harangues him for failing to sell the movie and that by dilly-dallying, Benchley missed his chance to sell the rights, with Disney having already produced a film. He answers "phooey", in the style of Donald Duck. Disney released the animated "Reluctant Dragon" segment on VHS in 1987 as part of the Walt Disney Mini-Classics series, along with the short Morris the Midget Moose. The full feature was released on VHS in an edition sold only at Disney Stores. On December 3, 2002, the original full-length feature was released on DVD in its original theatrical form (with the live-action studio tours) as Walt Disney Treasures: Behind the Scenes at the Disney Studio. In 2007, it was again released in its original theatrical version on DVD, this time as a Disney Movie Club exclusive DVD, available only to club members for mail or online ordering. Shortly afterward, this DVD was also made available in the Disney Movie Rewards program along with some of the other Movie Club exclusives. The "Reluctant Dragon" segment is the main attraction, along with three other cartoon shorts, on the Disney Animation Collection Volume 6 DVD, which was released in America on May 19, 2009. The other films bundled with it were Ferdinand the Bull, Goliath II and Johnny Appleseed. In the UK, the "Reluctant Dragon" segment was paired with Mickey and the Beanstalk and released during 2004 on DVD as Disney Fables Volume 6. On August 12, 2014, the full-length feature version of The Reluctant Dragon was released in HD as a bonus feature on The Adventures of Ichabod and Mr. Toad/Fun and Fancy Free Blu-ray set. The Reluctant Dragon and Sir Giles make various cameos in the 1988 Disney/Amblin Movie Who Framed Roger Rabbit. The Reluctant Dragon also makes brief cameos in Disney's House of Mouse, most notably in the start of the intro. ^ "The Reluctant Dragon: Detail View". American Film Institute. Retrieved April 13, 2014. ^ a b "Richard B. Jewell's RKO film grosses, 1929–51: The C. J. Trevlin Ledger: A comment". Historical Journal of Film, Radio and Television, Volume 14, Issue 1, 1994. ^ Schickel, Richard (1997). The Disney Version: The Life, Times, Art, and Commerce of Walt Disney. Chicago: Elephant Paperbacks. p. 260. ISBN 1-56663-158-0. The Reluctant Dragon at Don Markstein's Toonopedia. Archived from the original on January 9, 2017. This page was last edited on 11 February 2019, at 03:23 (UTC).